After enjoying the beautiful landscape and food of Punjab, we were excited to head to Jammu and Kashmir and have a slow travel experience. We wanted to spend more time in South Kashmir- Anantnag and had plans to visit lesser known places. However, we were not able to head to the valley as terrorist Burhan Wani, who hailed from Anantnag was taken down by the Army and the situation was pretty tense with curfew imposed. Hoping that the situation would die down, with the freedom of being on a road trip and the luxury of no fixed itinerary we decided to head to Dalhousie for a sojourn. Our romance with good roads continued, courtesy BRO. The road from Pathankot to Dalhousie was absolutely spotless but for a few patches- wide winding roads, chilly wind and breathtaking landscapes along with the crystal clear river 'Ravi' was such a captivating sight. We were thanking our stars to have been born in such a breathtaking and beautiful country which offers a traveller everything from mountains, beaches, historic monuments, rich history and lip smacking food. We were there during monsoon and came across numerous small waterfalls. 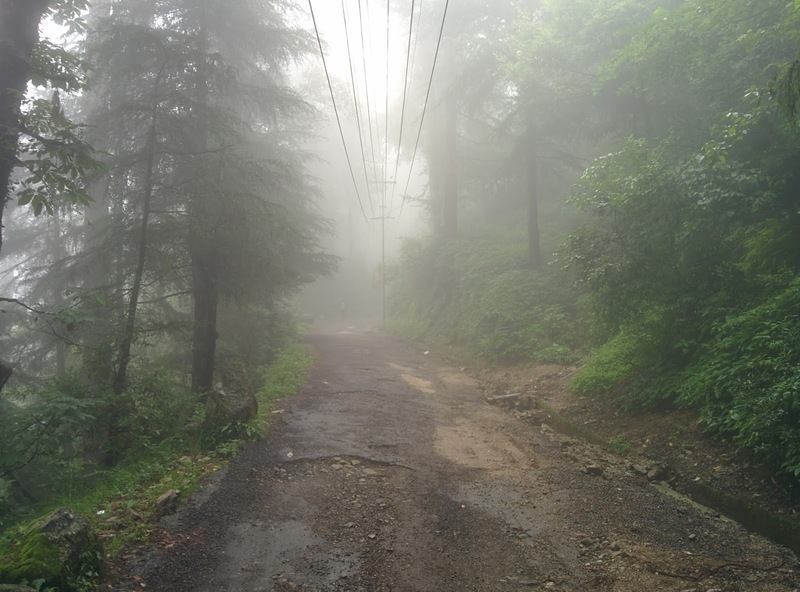 Unlike many other hill stations, the popular Dalhousie has wide roads and riding here was such a fun experience with tall pine trees cushioning the road and the orange and green leaves adding on to the charm. It is always a delight to ride on ghat roads as every turn unfolds new landscape. This popular hill station is always buzzing with activity. 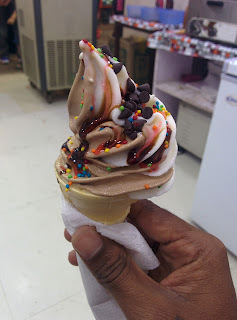 Gandhi Chowk is filled with several eat outs that serve wide range of delicacies and amazing softy ice cream. There are numerous options to choose from cafes, restaurants to small stalls set up by local vendors that sell some finger licking good food. However, one stall that completely stood out was set up on a bright yellow color scooter that was not just an eye candy but was selling amazing bread omelette and maggi. Apart from the food stalls, the main chowk has a Tibetan refugee market selling a lot of souvenirs and warm clothes at affordable prices. The mesmerizing hills have always had a captivating effect on us. The best part about any hill station is their pleasant climate that is perfect for long walks and garam chai. We took off on one such walk right opposite the Tibetan market. The best part about the walk was amazing green vegetation around, thick mist setting in and we were not able to see where the road lead us. It was just us and Nature for company with no vendors trying to hard sell anything. During the walk we struck a conversation with a local who lived close by and was walking back home, he gave us this tidbit that this old narrow isolated steep road lead to Khajjiar. Most of the vehicles do not use this road as there is a better road that is well paved. 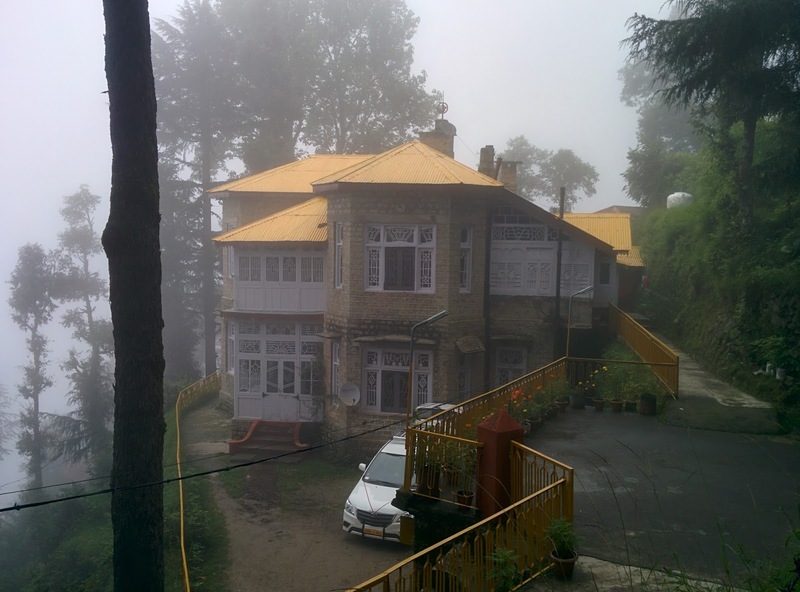 We also saw a few colonial buildings, which Dalhousie is known for, with Victorian and Scottish architecture and en route we stumbled upon one such age old bungalow that is now converted into customs guest house- amazing perks of working for the Government. Around 12 km from Dalhousie is KalaTop which offers great views of the Pir Panjal Range- the largest range of the lower Himalayas. Kalatop is also known for it's sanctuary and though vehicles are permitted inside the sanctuary we decided to hike this 3 km stretch. It was a beautiful and even path and we just did not break a sweat. We thoroughly enjoyed the trek path, it felt like exploring the jungle on your own. 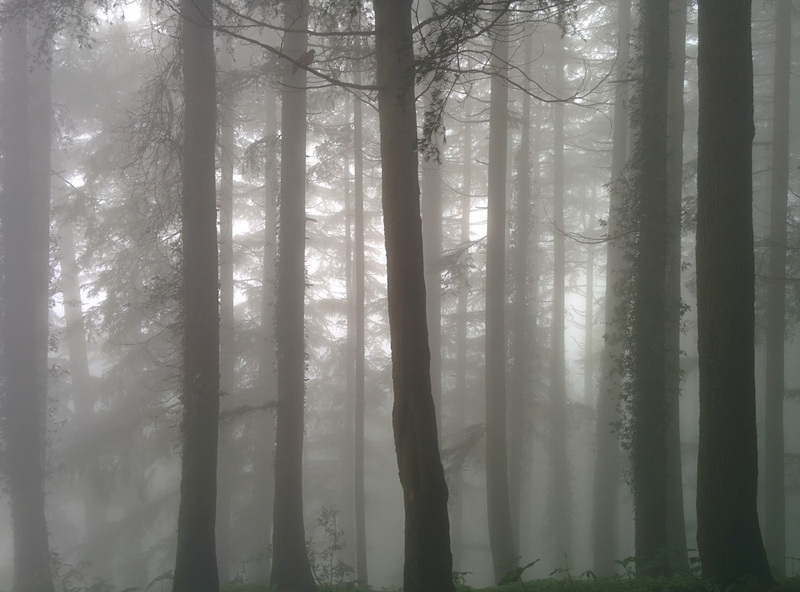 For the more adventurous souls, there is a 12 km trek path from Kalatop to Khajjiar. We were not able to catch a glimpse of the snow clad peaks of Pir Panjal as it was very misty but we did enjoy a hot plate of Maggi and adrak chai. The forest rest houses here wold be an amazing place to stay but it requires permission which has to be sought from 'Chamba Forest Office.' If you wish to take your own vehicle inside the sanctuary, the tickets are priced at Rs.250 for cars and Rs.50 for bikes. A 25 km ride from Dalhousie took us to Mini Switzerland- Khajjiar. While Dalhousie is surrounded by 5 hills, Khajjiar sits on a small plateau and is a fusion of lake, pasture and forest. We had heard so much about the beautiful meadows of Khajjiar and finally were able to make it. The amazing green meadows surrounded by massive pine trees and a pretty water body in the middle felt like a dream destination. It was such a stunning and breathtaking landscape to say the least with cattle grazing in the meadows. The meadows have places to stay as well and we saw amazing cottages run by Himachal Government but we were not able to see a single soul and were not sure if it was operational. The forest rest-house also would be an amazing place to stay provided you are working for the forest department. Despite being a very popular tourist attraction, the vast stretch of meadows provides ample space for everyone and not seem too crowded. There are some interesting activities like zorbing and para gliding and a few restaurants to dine. Sadly, with tourism comes commercialism and we were disheartened to see some vendors use Rabbits for commercial purposes and offer tourists to click pictures with rabbits for a fee. While we politely declined, they refused to budge and tried to lure tourists by showing the adorably cute baby rabbits. For their bread and butter they were caging these rabbits and using them as a source of entertainment. It was sad and depressing to see these animals tortured for our recreation and pleasure. We were not able to understand the significance behind taking a picture with a rabbit. Though the roads from Dalhousie to Khajjiar were narrow and partly well paved it was an amazing ride through thick forests that were dotted by massive trees. En route there was a very interesting stop where the toys of Indian Army were at display. Right around Dalhousie Public School, a MIG 21 caught our attention and we parked our bike to checkout the rest of the battle machines. There was a T55 tank, a frigate and a few jeeps mounted with assault rifles on display. Our stay in Dalhousie was at Hotel 'City Lite' near Gandhi chowk. A wonderful stay option- our room had a lovely balcony that offered great views of the green valley. The neat and clean rooms were spacious and loaded with modern amenities. Their food and service was outstanding. Their complimentary breakfast was like a full course meal in itself. Though the hotel was packed to full capacity and it was buffet breakfast, the hotel staff were particular in serving hot bathuras to each guest rather than just piling it up. The local apple juice that they served was so addictive that we had four glasses. We enjoyed our evenings at the balcony munching yummy veg pakodas and sipping masala chai, which was just perfect for the cold weather. 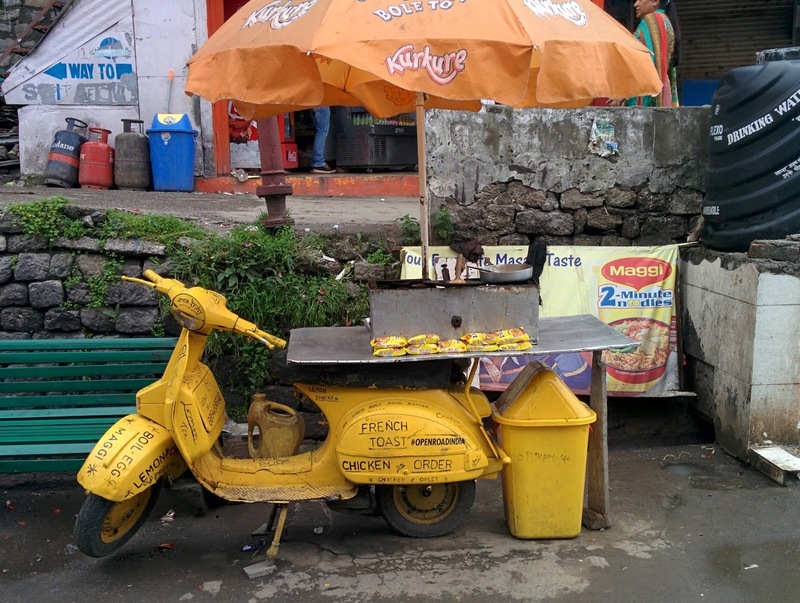 Gandhi chowk which is a paradise for foodies is at walk-able distance from the hotel. After spending a couple of days in Dalhousie, we decided to head to Jammu and with monsoon just arriving in Dalhousie we witnessed pretty heavy showers. Thanks to one of the many Indian Army pickets en route that was kind enough to give us shelter from the rain we saved ourselves from getting drenched. After waiting it out, we left again and the smell of earth after rains was so enchanting. Another heavy spell caught us en-route and we quickly walked into a very humble dhaba- Krishna Dhaba on the highway from Dalhousie to Pathankot, that served us amazing and hot aloo parathas accompanied with the best adrak chai we have ever had. The place was very clean and hygienic and perfect for a good hearty meal while on the road. I am in love with this post, it's images and the info. shared. Right while scrolling down this post, I told my husband "humko Dalhousie jana chahiye". And that's a great impact a blog-post can make Ram & Reshma. Beautiful composition. Am glad I landed here. Humbled by your words Tara and glad that you enjoyed the post :) Hope you plan your trip to Dalhousie soon and share your experience!! Thanks a bunch :)Plan a trip soon and have a gala time there..